Veganuary inspires and supports hundreds of thousands of people around the world try a vegan diet for a month. 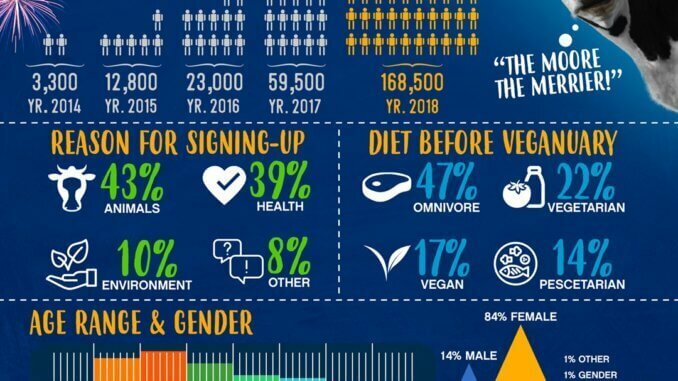 The 2019 Veganuary campaign launches in early December 2018, with new contents released on the website and social media channels. Participants can sign up at the Veganuary website, they’re then supported to try vegan through emails, social media content, membership of a Facebook support group, and a website full of helpful resources like recipes, a starter kit and meal plans. Participants can also choose to use the month to raise money for good causes. The Veganuary pledge is run by UK non-profit organisation by the same name, founded in 2013. It is more than a pledge though: it also supports brands, manufacturers, and retailers to expand their vegan options, supports vegans to become advocates, and works with decision makers for the interests of vegans and the vegan-curious. The pledge is taking the world by storm: over 250,000 people in 193 countries taking part since 2014. While in January 2014, 3,300 people took part, this number was a staggering 168,500 in 2018! In 2019, over 300,000 people are expected to participate!